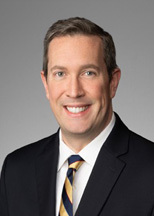 Chris McFadden defends employers in litigation matters involving discrimination, harassment, wrongful termination, and other workplace disputes. He regularly counsels employers on wage and hour practices, noncompetition agreements, leaves of absence, and the protection of confidential information. Mr. McFadden has drafted and implemented effective policies in areas such as social media, weapon possession and workplace violence, personal mobile device use, harassment, and workers’ compensation. He also conducts internal investigations of workplace matters to help employers identify and remedy problems and minimize liability risks. Mr. McFadden also represents corporate and governmental clients in commercial litigation, tort defense, and education law matters. While in law school, Mr. McFadden received CALI Awards in Employment Law, Legal Research and Writing, Contracts, and Community Property. Mr. McFadden served as a Judicial Extern to The Honorable Jon W. Thompson, Arizona Court of Appeals, and as a Legal Intern at the Disability Rights Legal Center. He has served his community by working with Habitat for Humanity and the March of Dimes, volunteering as a guardian ad litem, and volunteering as a mentor and panelist for the Judicial Intern Opportunity Program. Mr. McFadden has lectured on a wide range of employment law topics, including presentations on the Americans with Disabilities Act (ADA), the Family and Medical Leave Act (FMLA), the compensability of donning and doffing under the Fair Labor Standards Act (FLSA), avoiding harassment claims, and drafting effective handbooks. He has also written more than fifty published articles on employment-related matters.